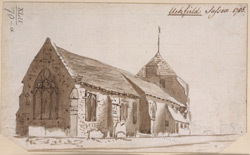 The parish church of Uckfield in Sussex, as seen in 1786. In 1839 it was rebuilt, although the chancel and tower seen here, were kept. Uckfield is a small town lying on the London to Lewes road. The church, lying at the top of the high street, was originally the centre of the village.